Dr Giampaolo D'Alessandro is Associate Professor of Applied Mathematics. He obtained an MSc in Theoretical Physics from the University of Florence, Italy, and a PhD in the same subject from the University of Strathclyde. 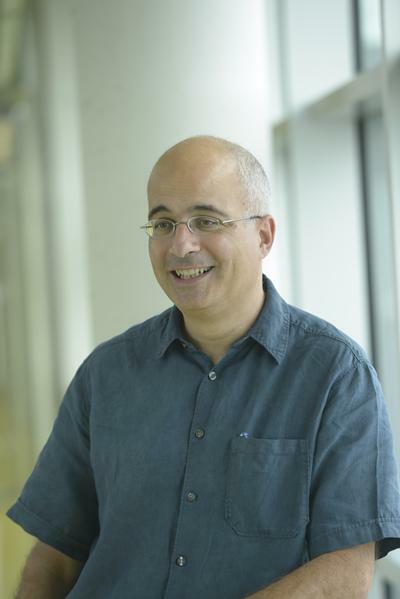 After a post-doctoral fellowship at the University of Geneva, he joined the University of Southampton in 1995 as a lecturer in Applied Mathematics. He has also paid extended visits to the University of Arizona in Tucson, the University of Wisconsin Madison and the University of Marseilles, where he spent one year supported by an EPSRC/MRC grant. Dr D'Alessandro's research interests are in differential equation based modelling of optical devices and phenomena, in particular in the context of liquid crystals. He is particularly interested in developing clever numerical algorithms to model liquid crystal configurations and to analyse experimental data to determine liquid crystal parameters. His interest in modelling is also reflected in his teaching which has covered over the years Numerical Methods, Electromagnetism, Mathematical Biology, Mathematical Modelling with Differential Equations and Biological Fluid Dynamics. To all these modules he has tried to convey his enthusiasm for an accurate and effective mathematical interpretation of the world around us that will ultimately lead us to a better understanding of it and the development both of new science and new applications. Dr D'Alessandro is a member of the Academic Steering Committee of the PhD training virtual network MAGIC (a web based system for delivery interactive post-graduate courses) and has also been, for five years, a member of its Management Committee. He is currently a member of the steering committee of the British Liquid Crystal Society. 1992-5 Postdoctoral fellow at the University of Geneva in the group of Mathematical Physics, Headed by Prof J P Eckmann. Brown, K. M., Donohue, D. E., D'Alessandro, G., & Ascoli, G. A. (2005). A cross-platform freeware tool for digital reconstruction of neuronal arborizations from image stacks. Neuroinformatics, 3(4), 343-360. D'Alessandro, G. (2003). Axiope: data sharing using distributed catalogs. Neuroinformatics, 1(3), 285-288. Garcia, L., Audin, J., D'Alessandro, G., Bioulac, B., & Hammond, C. (2003). Dual effect of high frequency stimulation on subthalamic neuron activity. Journal of Neuroscience, 23(25), 8743-8751. Scroggie, A. J., Oppo, G-L., & D'Alessandro, G. (2000). Sensitivity to noise in synchronously pumped optical parametric oscillators. Journal of the Optical Society of America B, 17(1), 84-89. Podoliak, N., Perivolari, E., Bennett, T., Proctor, M. B., D'alessandro, G., Regrettier, T., ... Kaczmarek, M. (2017). Compact optical device for measuring liquid crystal elastic and dynamic properties. Poster session presented at SPIE Optics + Photonics, San Diego, California, United States. Podoliak, N., Mavrona, E., Mailis, S., Gill, J. R. E., D'alessandro, G., Apostolopoulos, V., ... Kaczmarek, M. (2017). Intrinsic and photo-induced optical properties of photoaligning azo-based materials coupled with liquid crystal systems. Paper presented at SPIE Optics + Photonics, San Diego, California, United States. Rogers, H., Holmes, C., Daly, K., Carpenter, L. G., Gates, J. C., D'Alessandro, G., & Smith, P. G. R. (2013). Tilted Bragg grating based optical components within an integrated planar platform. Paper presented at Photonics West: Integrated Optics: Devices, Materials, and Technologies XVII, United States. Holmes, C., Rogers, H., Daly, K., Carpenter, L., Sima, C., Mennea, P., ... Smith, P. G. R. (2013). Tilted planar Bragg grating refractometers. Paper presented at CLEO-Europe/IQEC 2013, Munich, Germany. Rogers, H., Holmes, C., Mennea, P., Gates, J. C., Smith, P. G. R., Daly, K., & D'Alessandro, G. (2012). Experimental observation of coupling between physically separated planar waveguides utilising tilted Bragg grating structures. Paper presented at European Conference on Integrated Optics (ECIO), Spain. Broderick, N. G. R., D'Alessandro, G., Fitt, A. D., Ibsen, M., Monro, T. M., Richardson, D. J., & Taverner, D. (2000). Nonlinear polarisation effects in fibre Bragg gratings: experiment and theory. Paper presented at CLEO/Europe 2000, .